February has been a great month for me despite being dogged by a virus and a cold! I started the month by clocking up more steady miles and a special invitation to attend a Team GB Podium Riders training camp. The Olympic Podium Programme (OPP) is dedicated to supporting the highly skilled elite athletes as they aim to win medals in major competitions. They are supported by an equally committed and focused staff, including team managers, coaches, mechanics, masseurs, sports scientists etc and it was great to be in their company. I was really happy to find that I still had plenty of speed despite only doing steady miles for the best part of 6 weeks. Looks like the base miles in January did their job! The highlight of the training camp was spending time with Jody Cundy who is a class act and was happy to give me some valuable hints and tips. 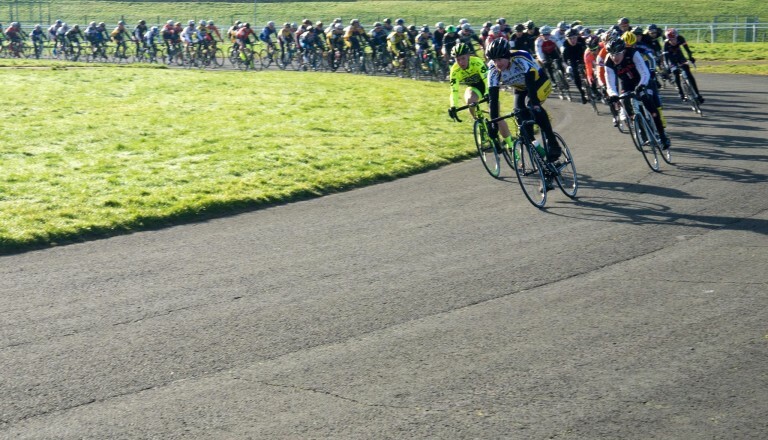 Having had a week off my bike at the end of the February with a bad cold I got to ride my first road race of the year – the 52nd Eddie Soens Memorial Road Race in Liverpool. With 175 riders on the start sheet from Elite through to 4th Cat, it was an exciting prospect. The race is organised as a handicap with the slowest group setting off first and the 1st Cat and Elite riders going last. I was in the 2nd Cat group who set off before the last group. The pace was fast and furious and there was no room for error as the race is renowned for its big crashes. 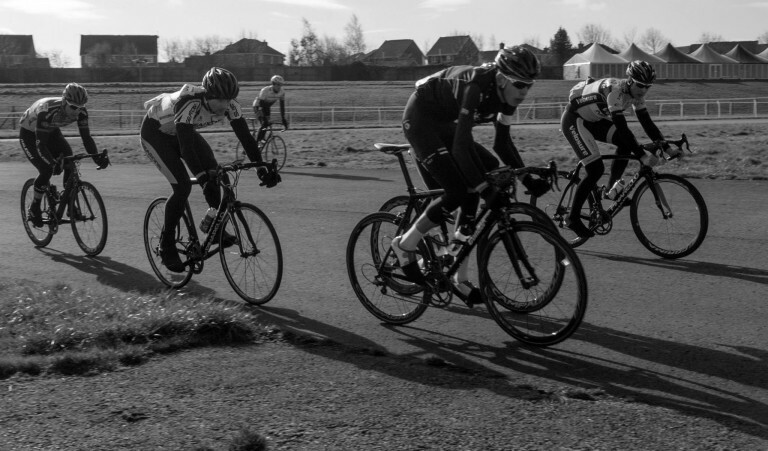 It was at about the half way point that the faster riders caught up and dictated the pace at the front. I was really happy to find that I was comfortable with the pace at the front riding shoulder to shoulder with the Team Raleigh and Rapha JLT riders. I had a go at contesting the preme (intermediate sprint within the race) 13 laps from the end but didn’t quite manage it crossing the line 3rd. I also managed to get away in a break for a little while before we were reeled back in. I was in a great position on the last lap and really looking forward to having a go in the sprint at the end when another rider clipped my back wheel and undid my quick release. I miraculously managed to stay up on my bike which was a relief, but it ended my hopes of a sprint finish. Despite the near accident, I finished in 24th place- at the same time as the main bunch-and I was the first placed 2nd Cat rider (amongst all able bodied riders) so I was really pleased with the result. I can’t wait to get stuck into the Road races over the coming weeks in preparation for my first UCI World Cup race in early May at the Castiglione Della Pescaia, in Grosseto Italy. I’m also looking forward to some shorter distance Time Trial racing on my new Sensa Dura (this is an old post and the linked content no longer exists) – we’ll see how things go. Tagged merlin athletes, paralympics, team merlin. Bookmark the permalink. Jon, thanks for writing such a great piece. very inspirational. I have a question for you, how do you stay motovated when you are clearly so good already? and is it true that once you are at the top, is it harder to stay there? Hi Steve, thanks for your question. My motivation is made easier for me by focusing on the long term aim which is to win a medal in Rio. That said it is still hard to fit in all of the training required whilst juggling a full time job and young family and I constantly work on trying to keep the balance right. In terms of being at the top, I am a fair way of that at the moment, maybe if and when I win a rainbow jersey I will be able to answer that question!